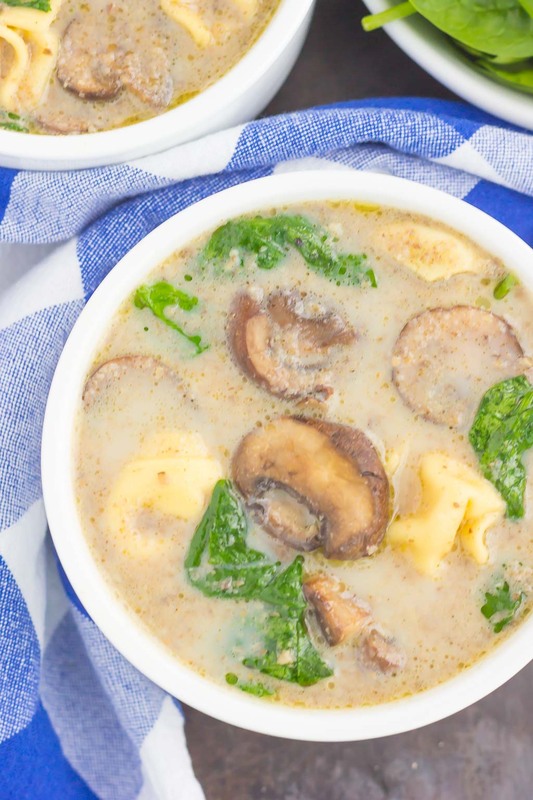 This Creamy Mushroom and Spinach Tortellini Soup is made in one pot and ready in just 30 minutes. 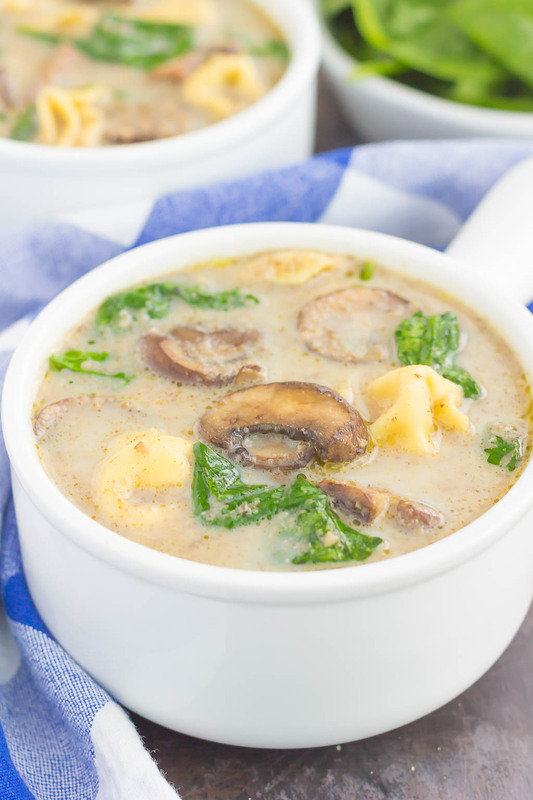 Packed with fresh mushrooms, cheese tortellini, and baby spinach, this soup is creamy, comforting, and will warm you right up! We’re finally nearing the end of February and I’ve got the most warm and coziest recipe for you! After spending last week in New York City (check out Instagram for more highlights of my trip! ), I’m ready for some good, old-fashioned comfort food. Not that NYC didn’t have some delicious food, because it sure did and I’m already planning my next visit back (NYC is my most favorite place on earth). But, before we get into the good stuff, can I just talk about my love of mushrooms? If you’ve been hanging around here long enough, you may remember me talking about the good ‘ole days, back when I was in college years and years ago. See, back then, I kind of lacked domestic skills, and my friends made fun of me for it. My version of ‘cooking’ was cracking open a can of soup and heating it in the microwave, or toasting a bagel for a sandwich. But, when I felt like testing out my culinary skills a bit more, I often opted for mushrooms. 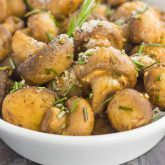 I would melt some butter in a skillet, add some salt and pepper, and saute those mushrooms until golden and caramelized. And that’s it! Those mushrooms would be my dinner. In fact, I’m embarrassed to admit that i ate the whole container of mushroom myself. In one sitting. Yep…I was that addicted to mushrooms back then. Nowadays, not much as changed mushroom-wise (I still L-O-V-E them), but luckily, my domestic skills have greatly improved. I can clean and cook with the best of them! Organizing and cleaning is the name of my game, as is finding my way around the kitchen (thus the food blog, right?). And mushrooms. Well, I’m hoping you know by now that mushrooms will forever be my most favorite vegetable. I try to sneak them into practically everything! 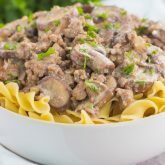 From this Creamy Sausage and Mushroom Rigatoni, Garlic Parmesan Gnocchi with Mushrooms, Basil Pesto Pasta with Broccoli and Mushrooms, Garlic Parmesan Pasta with Spinach and Mushrooms, and Cranberry Edamame and Mushroom Quinoa Bowl, to those Roasted Mushrooms with Rosemary and Garlic and this Mushroom Wild Rice Pilaf. There are plenty more mushroom recipes around here, but that’s just naming a few…whew! Now, onto soup. You also know that soup is one of my greatest food loves. Besides mushrooms and pizza, of course! I could eat soup every day, and practically do once the weather turns cold. So, of course, my love for soup and mushrooms make me all warm and cozy. Which brings me to today’s latest (and greatest) dish. If you’re a mushroom and soup lover like I am, then this soup was made for you. And, really, this Creamy Mushroom and Spinach Tortellini Soup couldn’t be any easier to whip up. But, you knew that was coming, right? 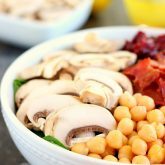 I adapted this soup from my Easy Cream of Mushroom Soup recipe that I shared over two years ago. In fact, it was the third recipe of the 30 Minute Thursday series. Can you believe I’ve shared a 30 Minute Thursday meal with you once a month for the past two years?! Everything gets thrown into one pot, which makes clean-up easy breezy. There’s no cream in this soup, only a splash of milk to get that creamy texture just right. I used an immersion blender to blend the soup before adding the milk. While you don’t have to do this, it gives the soup that extra boost of flavor from the mushrooms and savory broth. And let’s not forget about the cheese tortellini and spinach! I used the fresh kind of tortellini that you can find in your grocer’s refrigerated section, but frozen tortellini would work just as well, too. I also used a few handfuls of fresh baby spinach to give it that pretty green color and a hint of flavor. 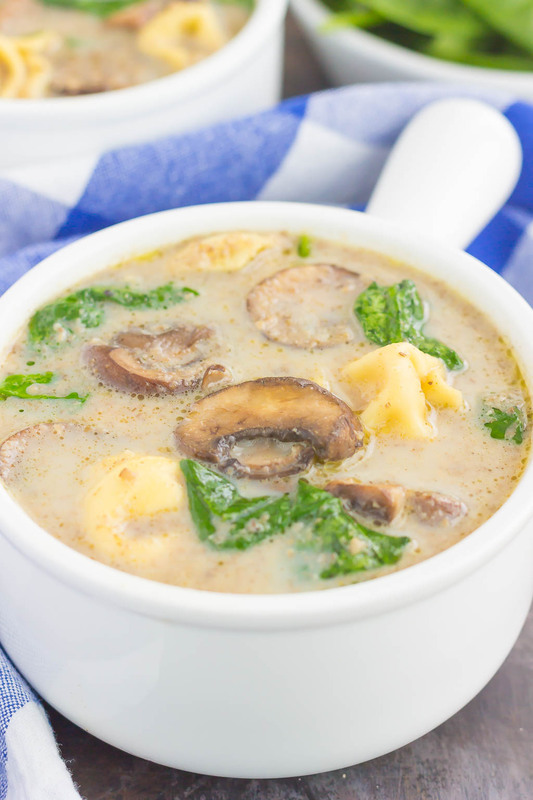 In no time, the hearty, thick, and comforting Creamy Mushroom and Spinach Tortellini Soup will wow your tastebuds. Whether you’re cooking for your family or just yourself, I promise this soup will not disappoint. It’s perfect for the season and made for soup and mushroom fanatics everywhere! Looking for more easy soup recipes? I’ve got you covered! Melt butter in medium soup pot or sauce pan over medium heat. Once butter is melted, mushrooms, onion, garlic, thyme, salt, and pepper. Cook over medium heat until mushrooms start to caramelize, about 5 minutes. Then remove one cup of the mushrooms and set aside. Stir in chicken and beef broths and bring to a boil. Remove pot from heat. Using an immersion blender, blend soup until thickly pureed. If you do not have an immersion blender, pour soup into a regular blender and mix until pureed. Then pour back into pot. Add tortellini and cook over low heat until tortellini is tender, about 4-5 minutes. Remove from heat. 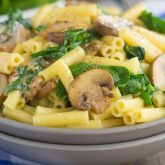 Whisk in milk and stir in mushrooms and spinach. You can find fresh tortellini in the refrigerated section of your grocery store, usually near the pesto sauce and grated Parmesan cheeses. If you prefer to use frozen tortellini, increase cooking time by 3-5 minutes, or until tender. Sounds like the perfect meal for a rainy, cold Monday! I'm so glad that you share my LOVE for mushrooms. I can easily eat an entire container myself. They're the best! Thank you, Sarah! Tortellini in soup is one of my favorite ingredients! I'm dying to go to NYC -- I loved seeing it on IG, especially Carrie's apartment! I lacked domestic skills when I was younger and single too but I did always love mushrooms as well. I love that you ate a whole container for dinner! :) This soup is right up my alley and perfect for our rainy weather! NYC is such an amazing place! I think you would LOVE it, Marcie! Thanks for the soup love! Love this soup and I'm going to try it very soon! Glad you had fun in New York, Gayle :) I watched your stories! such a comforting soup, love it Gayle! Hope you had a great time in NY! haha I love me some mushrooms too! I've always been a huge fan! 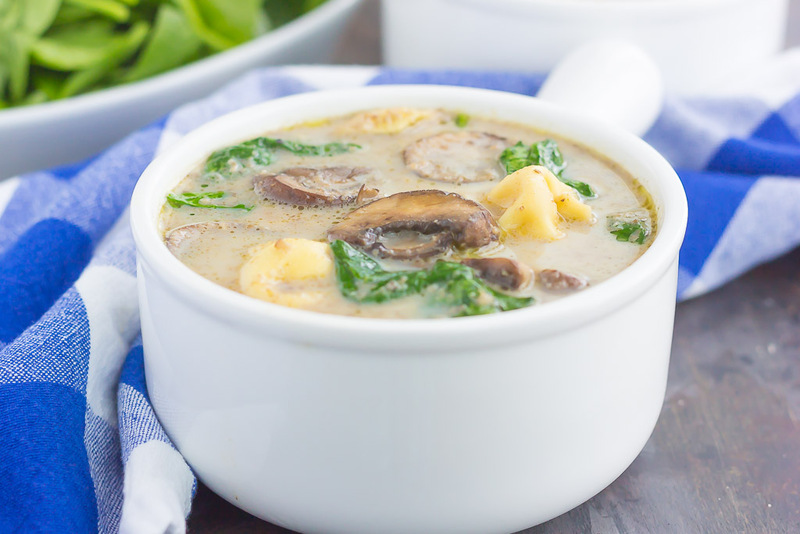 This soup looks delicious - mushrooms + spinach is one of my favorite combos! Mushrooms are the best! Thanks, Ashley! I could certainly make that with a veggie broth too! That would definitely work, Deborah! Given that both mushrooms and tortellini are on my top 10 list of BEST FOODS EVER, this is obviously the soup for me!